We have just received copies of Dr. Lyman B. Smith's most recent work on the new species in Bromeliaceae that have been discovered in the past few years in the "Lost World" area – the highlands of Venezuela, Colombia and British Guyana, during the period from 1948 to 1955. These new species have been published in the "Memoirs of the New York Botanical Garden," 1957, covering two important areas, "The Botany of the Guyana Highlands – Part II" and "Botany of The Chimanta Massif – I". These explorations, which have been carried out under the auspices of the New York Botanical Garden and the Chicago Natural History Museum, have been led by the eminent botanical collectors Dr. Julian Steyermark of Chicago's Natural History Museum and Dr. Bassett Maguire of the New York Botanical Garden, accompanied by others at various times, J. J. Wurdak, R. S. Cowan, C. K. Maguire, Mrs. K. D. Phelps, C. B. Hitchcock, L. Politi, G. Budowski, G. S. Bunting, D. B. Fanshawe and B. Maguire, Jr.
Their collections have turned up a very unusual lot of new species in three of the rarer bromeliad genera; fourteen species and one variety in Lindmania; four in Brocchinia and thirty-four in Navia (!) 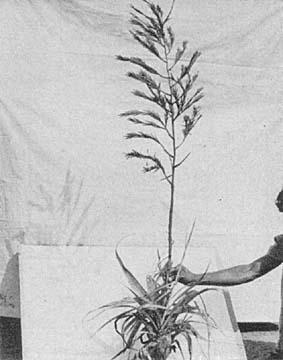 Besides that there were four in Pitcairnia; two in Vriesia; two in Aechmea; one in Guzmania and one variety in Tillandsia making a total of sixty-one new species and two varieties, all of which have been described by Dr. Smith. As Dr. Smith has stated in his forward, – " Brocchinia and Navia are nearly perfect for a definition of the Guayana Highland area. They were both discovered in 1820 by Martius at Araracoaria in southeastern Colombia, which is at one end of the area, and Navia extends to Tafelberg in Suriname at the eastern end. Species of one or both of them have been found at nearly every point of exploration in the area, but as yet none have been discovered outside of it." Another botanical paper reached the editor's desk this month, that from Prof. Eizi Matuda of the Matuda Herbarium in Mexico City. Under the commission of the Government of the state of Mexico (capital, Toluca), he has published a description of bromeliads and aroids of that state. 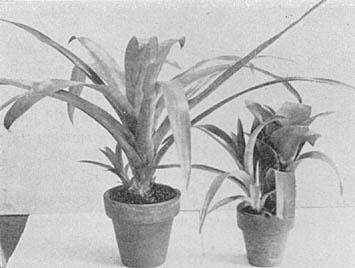 Twenty-five photos and drawings are used to illustrate many of the forty-two bromeliads described. We have failed previously to mention that the January 1957 issue of Natural History magazine published an article by Jeannie Harris entitled, "The Pineapple – Fruit of Royalty" which fulfills the idea of its title in tracing how "for 300 years European nobles and others of wealth practiced hothouse culture of pineapples." Although the article covers much of what we published about the production of pineapples in Hawaii, in the May-June 1956 issue of the Bromeliad Bulletin, and uses some of the same pictures, it has additional interesting material concerning the formation of the flower and the use of pineapple's by-products as well as the use made of the pineapple leaf fiber in the Philippines; this pina cloth has become world-famous in its exquisite, gossamar-like refinement. Up in Providence, Rhode Island, the Sunday journal featured, recently, in their Indoor Gardening column, two columns by Katherine B. Walker about bromeliads as a "New House Plant"–accompanied by a photo of Tillandsia ionantha although it was misnamed, T. circinnata. THE COVER – An unidentified Hechtia growing among the roots of a Ficus (rubber tree) chooses a difficult position for its saxicolous existence in Mexico. Both plants are "on the rocks." (!) The yellow, branch-like roots of the Ficus climb to the crest of the rocks where they fan out to support a large wide-spreading tree above. At the base, the Hechtia clings tenaciously with its roots hidden in the crevices of the roots. These conditions we might call very unsatisfactory but to them the conditions are quite satisfactory, as they seem to want to live there. This is one of the more unusual habitat localities for a Hechtia. Five years ago my sister gave me a plant which she had brought back for me from Italy. Neither of us knew the name, but we found it intriguing, for the plant consisted of two leafy vases of minutely toothed leaves which reminded us at the time of shuttlecocks. Each leaf was finely and freely lined with white and way down in the centre of each vase there was what looked like a sodden mess of petals. That plant was put with the miscellany of other plants in a greenhouse and left to its own devices which turned out to be quite clever, for although the plants died they left two descendants who are now just like father and mother, but alas at the time still without a name! Without knowing it I had been introduced to Bromeliads. Two years later, and now three years ago, we spent a vacation in the Canary Islands off the west coast of Africa. The climate there is sub-tropical and the islands have a close affinity with Mexico. I became friendly with the Gardinero Major of the island of Las Palmas and spent much of my time in his company. On leaving he presented me with a grand variety of plants – senecios, euphorbias, cacti and other succulents and two special plants which he called Bromeliads. It was then that something clicked, and on arrival home my first object was to find out more about these things called bromeliads. I have an extensive horticultural library and soon I knew that there were such plants as Aechmeas, Billbergias, Tillandsias, Vriesias. Suddenly I was caught up with them and from that time my enthusiasm has known no bounds. With enthusiasm knowledge came quickly, and I was able to track down my first plants to Nidularium innocenti lineatum and my second to Quesnelia liboniana this latter by reason of the stolons. Now came the urge to gather unto me my little ones and not a single florist or nursery in the vicinity was missed in my hunt for additions – success was very limited – indeed only two plants which were identified later as Tillandsia Lindenii (now Cyanea) and Vriesia splendens were added. As for cultivation, very little information was available here, but the basic requirements appeared to be heat and humidity. Thus new heating was installed operated by thermostatically controlled electrical beating tubes and set at 60° F. I considered many ways of breaking the direct rays of the sun without diminishing too much the amount of light, so as to simulate the softness of the forest, and finally decided to use polythene sheeting which, at that time, had not been considered horticulturally for this purpose. By lining the house I actually minimized two other problems as well: humidity and winter heat conservation. Humidity is stepped up no end by the use of polythene, and in the dry parts of your country where the provision of humidity is a real problem I strongly recommend you to experiment with this material. Winter heat is conserved by the air space formed between the glass externally and the sheeting internally and a considerable saving in heating costs results and this method is practised now on a large commercial scale. I knew of only three establishments in England which sell bromels – and their stocks are not held in wide variety, but nevertheless I added a number of plants from these sources and from the Chelsea Physic Garden who have been most generous in their help. By this time I had a good basis for my collection, which was soon to be enlarged further by a number of plants brought back by my sister from Holland. My collection increased until it comprised some eighty different bromels. Then came my greatest piece of luck when last year Maurice Mason kindly gave me a large number of offsets which included many from his visit to Costa Rica and as yet unnamed. This was a great acquisition and one for which I am very grateful and which I prize very highly. My collection now numbers about 150 different species and hybrids representing 21 genera of which I have had in flower during the last six months Tillandsia cyanea (coming up for a second spike), Nidularium innocenti and rutilans, Guzmania lingulata, Quesnelia liboniana, Aechmea fasciata, Cryptbergia Meadii, Neoregelia sarmentosa chlorosticta and three others one of which has most beautiful long leaves coloured a rich violet with violet tipped petals, various Cryptanthus and Billbergias. The potting material which I use is orchid compost plus leaf mould, peat and sand. I intend to experiment with bark fibre in the near future. The plants are mist-sprayed each morning and evening and their vases are kept filled with rainwater, but I find that the vases, particularly the nests, should be dry when in flower to preserve the inflorescence and those plants coming into flower are carefully avoided as much as possible when spraying. Damping down is rigorously practised. During the winter the house is not ventilated, but as soon as the weather permits I open up first one and then more of the understage ventilators but never top vents. The heat in summer often reaches 120° in the greenhouse but this lasts for short periods only. Humidity is kept at about 70%. For company my bromels have Epidendrons, Dendrobriums, Masdevallias and Peperomias dotted around. Another great piece of fortune came my way when I was at my horticultural bookseller's asking for anything on Bromeliads and Lyman B. Smith's "Bromeliaceae of Brazil" was shown to me. This I bought, and therein I learned that there was a Bromeliad Society in being but no address was given, so I wrote to Dr. Smith for details. That is how I came to apply for membership of this unique Society and with all the bulletins now at my finger-tips I feel that I am very close to my fellow boosters scattered throughout the world. To them I send my salutations and extend to each one of them a cordial invitation to meet me 'at home' whenever they are in England. The local name for a bromeliad is "wild pine", and, I'm afraid, it commands little respect from the populace in general. The reason for this, I suppose, is largely because "pines" are so frequently seen throughout Trinidad. Because of their abundance, they are accepted as a matter of fact, but they are also considered a nuisance when they invade citrus and cocoa plantations and overgrow the trees. Moreover, certain of the large tank species (such as Gravisia aquilega) are recognized as a public hazard because they serve as the breeding place of mosquitoes, particularly the malaria mosquito, Anopheles bellator. In spite of these failings, bromeliads, as we all know, are aesthetically appealing because of their great diversity of bizarre flower types – bizarre in their form, in their color arrangements and in their growth. Moreover the great variation in mode and place of growth of the plants, their dependent aquatic communities, as well as the fact that we associate these plants with the American Tropics where they are indigenous, all tends to create a fascination or feeling of mystery for the Bromeliaceae. 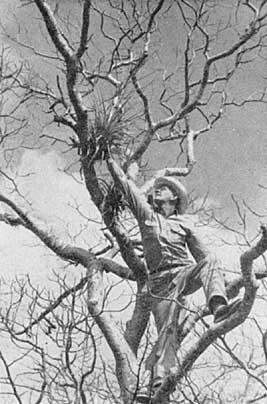 Since coming to the island in 1954, I have tried to evoke in Trinidadians an interest in their bromeliad heritage. This is being done mainly through the medium of the Annual Flower Show generally held late in March. The first year anything was attempted was 1955. At that time Dr. Wilbur G. Downs and I, under the aegis of the Trinidad Regional Virus Laboratory1 brought together as many species in flower as we could locate. In the course of field trips, the countryside was scoured for plants. Fifteen species were eventually selected for the show on March 12 and 13, and while it is true that not all were truly in flower at the time, nevertheless they all presented interesting inflorescences even though some had gone to seed. Our carpenters knocked together a nice exhibiting stand to which the plants (with identifying labels) were wired in various arrangements to present a pleasing effect. To our great pleasure, the exhibit was a success and created much favorable comment. The species displayed were: Gravisia aquilega, Aechmea porteoides, A. nudicaulis, A. Mertensii, A. lingulata, Tillandsia flexuosa, T. bulbosa, T. deppeana, T. utriculata, T. elongata var. imbricata, T. fasciculata, Vriesia procera, V. splendens var. longibracteata, Guzmania lingulata and Catopsis sessiliflora. Following the Flower Show we became more and more interested in bromeliads as botanical and horticultural specimens. We established a bromeliad "garden" at the St. Patrick Estate in the Arima Valley where plants were brought from all parts of the island. The main purpose of this enterprise was to eventually have nice specimens for photography purposes. Subsequently I started potting some of these plants for my own enjoyment at home, and it was some of these that were exhibited at the Flower Show March 24 and 25, 1956. There was no special section provided for bromeliads, so my plants, which were not in flower, were entered in the Foliage Plants Section. Plants exhibited were Vriesia procera, Tillandsia juncea, Aechmea Mertensii and A. bromeliifolia. Nothing came of this exhibit as far as awards are concerned, nevertheless, I determined to get the bromeliads more publicity. During the ensuing year, a proposal was made at a Horticultural Club meeting to create a special division for bromeliads in the Annual Flower Show. The idea was favorably received, and a tentative schedule of exhibit categories was prepared. 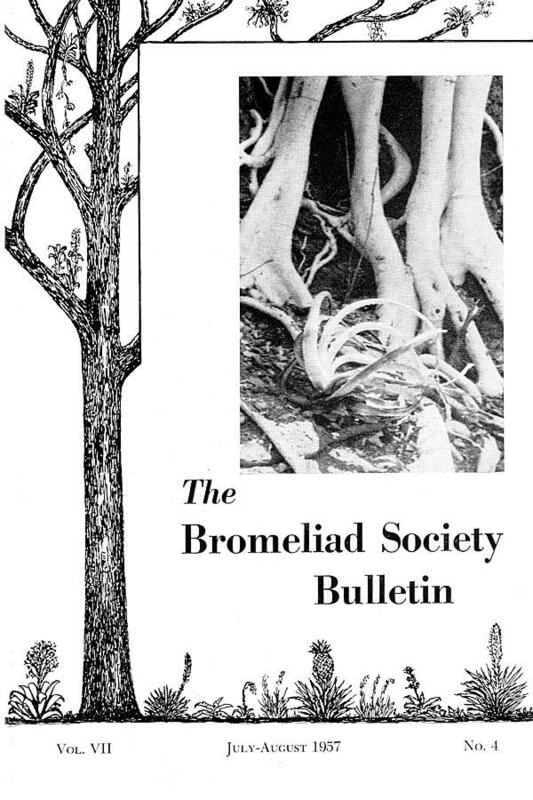 Unfortunately it was not possible to include those changes in the program for the 1957 show (March 30-31), however bromeliads were finally given formal recognition in the catalogue in Section V "Cut Flowers", Division (e) "Native Wild Flowers", Category 216 "Bromeliaceae (wild pine), collection of three flowering stems". Actually cut bromeliad flowers have figured in the wild flower division for several years but they occupied no formal niche in the catalogue. Specimens usually exhibited as they are flowering at this time of the year, are Gravisia aquilega, Aechmea nudicaulis and the very striking Hohenbergia stellata. The latter not infrequently wins a prize. Following last year's lead, I again entered potted specimens in the Foliage Plant section. With a larger entry this year, it was possible to make quite a pleasing display ranging from large specimens of spiny Aechmeas down to tiny Tillandsias. The ten plants exhibited were: the rare Gravisia aripensis (known only from the top of Trinidad's highest mountain, Cerro del Aripo), Aechmea dichlamydea, A. bromeliifolia, Vriesia procera, V. glutinosa, V. Splitgerberi, Guzmania sanguinea, Tillandsia juncea, T. anceps and Bromelia humilis. The Splitgerberi and bromeliifolia were noteworthy as they were commencing to send out inflorescences. 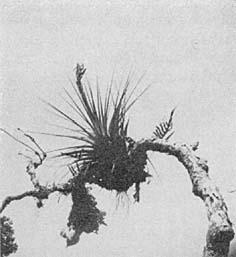 Dr. Downs also entered a very pretty little plant (mounted on a branch) of Tillandsia Gardneri, notable because the inflorescence was at anthesis. We were pleasantly surprised to learn later that the Gardneri and Splitgerberi (an uncommon species here) took a second and third prize respectively. This is a modest beginning, but we hope others2 will become interested in enjoying more the aesthetic qualities of Trinidad's rich heritage of wild pines. P. 0. Box 164, Port-of-Spain, Trinidad, B. W. I. 1 Our original interest in bromeliads lay in learning the names of the host plants serving as breeding places for disease-breeding mosquitoes. 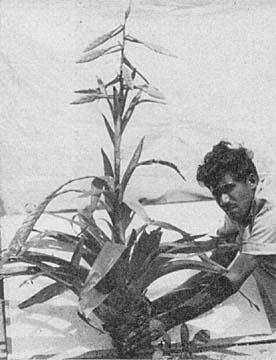 My four previous plant collecting trips to Mexico have been taken entirely by car, but in April 1957 I did it the air way. It is not the most interesting way but it certainly is the quickest; less than six hours of actual air travel from Orlando-Miami to Mexico City. In 1935 I went to Mexico the hard way. An artist friend, Tibor Pataky, motored with me in an old Chevrolet, dragging a trailer behind. The road from Laredo to Mexico City was not yet finished although it was supposed to be passable. This proved to be our main obstacle, but rewardingly interesting. My mission was plants, of course, orchids and cacti being firsts at that time. Mexico, due to its diverse up-and-down topography, produces an abundance of fascinating plant life and, as I was attracted to plants of all kinds, I noticed bromeliads secondarily, taking a few, pressing a few, and sketching a few. Gradually the bromeliads began to make a really big impression; alas, I have been an incurable addict ever since. Throughout miles and miles of desert land, where almost the only bromeliads in evidence were Hechtias and Bromelias, was the setting for my first foreign introduction to the family. Upon reaching the Tampico area, where more trees thrived, my eyes were startled to find what I was to learn was Aechmea bracteata. After that I began to look up as well as down. Transportation problems took precedent. To our dismay we learned that the nearly finished road to Mexico City was then closed on account of huge landslides; there was only one other way to get to Mexico City by car, which was from El Monte to Cerritos, Ciudad Maize and San Luis Potosi and the first part of this route was almost an impossibility in those days. However, no other course was open so we struck out across the Huasteca mountains with the only food, gas and other supplies which we would need, carried in the car. We reached San Luis Potosi weary but relieved, then turned south to Mexico City, the countryside continuing to be populated with the high desert side of plant life. However, east of Mexico City and down the mountains the picture changed, plantwise, as we entered the lush mountains of the state of Vera Cruz where I was first introduced to the rain forest areas of Jalapa, Coatapec and Cordoba. Here, for the first time, I saw the trees literally covered with bromeliads and other epiphytic flora. Never shall I forget my first impressions of these exotic bromeliads. Most of the bromeliads in Mexico are Tillandsias and the great diversity in form, size and color within this group, from T. tenuifolia (the small grass-like leaves) to T. grandis (the broad, massive granddaddy) would hold anyone's interest for a lifetime even if this were the only genus in Bromeliaceae. Tillandsia Butzii, T. lucida, T. Lieboldiana, T. streptophylla, T. Schiediana, T. punctulata, T. ionantha, T. andrieuxii, T. tricolor and many, many others were just a few of the Tillandsias that fell into eager hands, but I was then unaware of their names. I just knew they were extraordinary, unique plant experiences which had never come my way before. The high, cool mountains between Mexico City and Puebla brought new highland bromeliad gems. Here they were characteristically upside down. One outstanding pendant species, T. Macdougallii, not even named at that time, was so striking that it made us forget the laboring engine and boiling radiator of our car as we reached the 9,000 ft. crest. So far, we had experienced much of the central and eastern area, but nothing of the Pacific coastal area, so we went on the only passable road west and that took us to Acapulco. 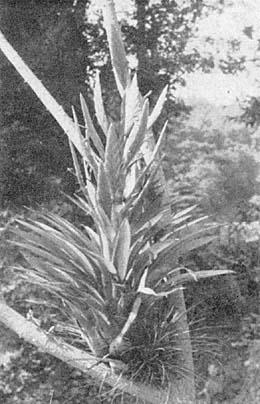 This trip yielded my initial discovery of a new species although this fact was not to be revealed until several years later; this plant, found in the state of Guerrero, proved to be Hechtia melanocarpa. It was nearly ten years later when Dr. Lyman B. Smith named it from the flowering material which was sent to him after the plant had ultimately produced a bloom in our garden. 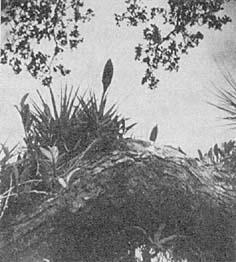 That was the prize terrestrial; two other notable bromeliads, one saxicolous, one epiphytic were found on that trip; the sturdy T. capitata, growing on rocks and tree roots and the fantastic well-named T. caput-medusae, the truly xerophytic epiphyte growing on small trees in a harsh, wind-swept and sunburned region. Many of the live plants were killed when fumigated but this factor did not dampen enthusiasm for Mexico; this trip had set the pattern for future work. So in the spring of 1936 Racine and I were Mexico bound on a postponed Honeymoon. Then it was a doubled enthusiasm in the search for each and every crazy bromel whether hanging upside down from an impossible tree or clinging to a precipice beyond reach. Tillandsia grandis, T. dasyliriifolia, T. imperialis came into our lives. T. grandis and a number of Hechtias and Tillandsias soon became residents of our garden. We studied them closely. I sketched a few and then with oil painted a few plant portraits, we reluctantly made a few herbarium specimens; we began to see a pattern in the habitats. This pattern was to be more fully understood many years later. T. Benthamiana, one of the inverted Tillandsias with velvet-like foliage. The summer of 1937 saw us, yet again, off to Mexico taking in additional territory in the Guadalajara and Oaxaca sections as well as the frequented familiar areas. In the state of Michoacan, near Morelos, we found our first plants of T. filifolia growing on rocks and those same plants are still in our collection. It is a charming Tillandsia with thread-like foliage not nearly as delicate as it appears. Each excursion added a few more bromels, although we were still collecting orchids and cacti. A new species of cactus, Peniocereus Fosterinaus Cutak, and a new amaryllid, Zephyranthes Fosteri Traub were discoveries that added fuel to our enthusiastic plant hunting trips. Other trips to Cuba, Brazil and Colombia as well as the war in the years between interfered with the Mexico-trend, but in 1952 I managed to squeeze in a short excursion into north Mexico across the border from Brownsville, between lecture dates in Texas! The purpose was mainly for just another bromeliad glimpse, even for only a few days. There is an A.A. for alcoholics but there is nothing that will cure an acute case of Bromelitis except more bromels. Thus, five years was too long to wait before a return visit to Mexico and April 1957 saw me eagerly bound for the Bromelandia south of the border. It seemed awfully mean to go without Racine but someone had to stay at home, so it was "ladies first" (!). This flight from Miami took fewer hours than days by car on our previous trips. In Mexico City Mr. and Mrs. Oather VanHyning of Winter Park awaited my arrival; they had motored down for their third trip. As impatient as an old fire department horse at the first clang of the alarm, I could hardly wait until I laced up my high boots, 'rarin to go! It was twenty years since my first sight of Mexico! Changes everywhere, yet, so many things the same. Better roads, of course, and many hundred miles more of them. Before the pattern of bromeliads in Mexico is understood there must be many, many more observations and collections made throughout that magnificent country where one can find every climatic and topographical condition from tropical sea-level to snow-capped mountains from arid deserts to dense, lush jungles. Deciduous oak forest (elv. 8,500 ft.) state of Oaxaca where xerophytic bromeliads and orchids abound. From a distance one would not think any epiphyte could be alive in such a dry, harsh, dead looking country, but it proved to be one of the best collecting localities. Only eleven of the forty-five genera that are recognized in Bromeliaceae are represented in Mexico; however, up until the present time only nine genera have been recognized as indigenous there. It was our good fortune to make the first collection for the record of a Hohenbergia, H. Guatemalensis, and also discover what will doubtless be a new species of Greigia, the first for this genus in Mexico. This last find was a surprise, indeed for it extends the range of this interesting genus several hundred miles to a point which must be nearing its northern limit. Strangely, this genus is confined almost exclusively to volcanic mountains, centering in Colombia. Tillandsia and Hechtia are the predominant genera in Mexico and you will meet them from the U. S. border to Guatemala. While Tillandsias are native to every country in the Americas, excepting Canada, nearly all of the Hechtia species known will be found in Mexico, wherever there are rocky desert areas, high or low altitude. These Hechtias, no doubt, represent some of the earliest members of the Bromeliad Family and are closely related to Puyas, Dyckias and Encholirions, all of which are confined to South America with the exception of one Puya native to Costa Rica. Doubtless the greatest range in form and size of Tillandsias in Mexico will rival that of any genus throughout the Bromeliad Family. The adaptability of some of the Tillandsia species and their great range in altitude as well as latitude is most interesting. We just naturally expect to find T. recurvata and T. usneoides from the U. S. to the Argentine although T. usneoides is rarely as vigorous in growth as in Florida and Louisiana. In Mexico T. Schiedeana has taken up residence wherever you meet T. recurvata; in fact, I believe it is more often met than the latter species is in the southern states. T. caput-medusae too, is common from Sonora throughout the country especially in the deciduous forests where wind and sun play a major part. T. Butzii, filifolia, ionantha, tenuifolia will also be found in this same group but they join the ranks of these xerophytes nearer the central part on down throughout the country. These latter species along with T. juncea and festucoides, fasciculata, polystachya, tricolor, punctulata, dasyliriifolia, may often be found in similar localities where the rainfall and humidity is much more prevalent at certain seasons. T. streptophylla, Seleriana and pruinosa are not as wide spread in their range and are to be found, mainly, nearer the eastern areas from Vera Cruz south. Most all of these xerophytic species mentioned have their leaves covered with coarse spreading cinereous scales and they can withstand wind, drought and sun. Others such as T. butzii, punctulata, polystachya, juncea, festucoides, tricolor, dasyliriifolia, fasciculata, tenuifolia, and filifolia have leaves covered with adpressed scales; they also have more numerous leaves which are, generally, closer together and in more crater-like forms; many of them can hold a certain amount of water in their leaf reservoirs. T. butzii is an exception in this group as it is bulbous in form but grows in compact masses. T. filifolia, tenuifolia, juncea and festucoides have very fine thread- or grass-like leaves and also grow in compact masses, thus each group have their own effective qualities for collecting moisture and resisting drought and wind and it is these conditions that create the often fantastic shapes such as in T. caput-medusae, streptophylla, pruinosa, Seleriana, ionantha and others. The sculptured pattern is sometimes made by elevation but not always by elevation alone. Moisture is one of the biggest factors. Where moisture is lacking we may find the different xerophytic types, often, regardless of altitude up to 8,500 ft. From 8,000 to 9,000 ft. generally, in pines or oaks we may expect to find Tillandsias with soft velvet-like foliage and usually having pendent inflorescences hanging from almost inverted plants of Tillandsia MacDougalii, T. Andrieuxii, T'. Benthamiana, T. violacea. These plants take their baths in moist clouds but could not live happily in lower dry or rainy areas. In the rain forest areas will be found, generally, wider leaf Tillandsias whether in lower or higher altitudes. These average from 5,000 to 7,500 ft. elevation. In these areas may be found T. gymnobotrya, imperialis or deppeana, (the T. deppeana here in Mexico will be quite different in shape and color from the different varieties of this species found in Trinidad, Costa Rica, Colombia or Venezuela), T. lucida, foliosa, Leiboldiana, or T. Bourgaei and T. prodigiosa at 8,000 ft. elevations. Throughout Mexico will be met Tillandsia fasciculata in one or more of its varieties. About ten varieties have been named of this most variable species in the genus, native throughout the Caribbean area from Florida to South America; I suspect that several more will be added to the list as other collections are made. They are always showy and interesting subjects pervading a great range of various altitudes, moisture or arid conditions and exposure to sun. One should not be surprised to meet this species under almost any condition wherever one goes in Mexico; in fact one should expect to find it wherever one goes except in the highest altitudes. I have never found any bromeliads growing above 10,000 ft. in Mexico and but few species between 8,000 and 9,000 ft. At these high levels the bromeliads will, more than likely, be Tillandsias or Pitcairnias. "Basilon-que rico Cha cha cha!" From every cantina came this deafening beat of Latin America's latest dance rhythm; came also the impact of bullets gone astray; police squads equipped with submachine guns; nights when the streets of Tegucigalpa were deserted except for armed forces. . . . No doubt about it I was back in Honduras, Central America where such happenings -are, shall we say, considered normal"! This time, the revolution started on the first of August 1956 in downtown Tegucigalpa's Cuartel Francisco Morazan; however, it was soon machine-gunned into extermination. When I felt that I would be less likely shot at in the forest, I was on my way to fulfill orders for Hondurean orchids. It was in the haunt of the rare Lacaena spectabilis orchid, between the cloud-forested mountain crests of Cerro Montanita and Cerro Uyuca, at an altitude of about 1500-2000 m. above sea level, that I found nature has outdone itself by adding some highly vivid colors to the otherwise uniformly dark green scenery; three bromeliads of great beauty and grace dominated the forest color scheme. The road, Tegucigalpa–Zamorano–Danli, which leads to these cold forests is bumpy and dusty, but relatively good. The dust is filtered off by all passengers that travel this route in the grinding Mixto trucks, by means of handkerchiefs tied around their faces (which sight, together with their colorful sombreros, stunning gun belts and cal. 38 sixshooters, makes them appear like a gang of evil. bandits, to be sure). In spite of this we soon reach our destination, the Cerro Montanita keeping our eyes open in order to find what we set out for. The red bromels catch our attention at once. They perch on the majestic old oaks in equal profusion as on the pines; and their heavy, scarlet or purplish-red inflorescences stand out like burning flames from the deep emerald glow of forest. Let us, therefore, have a closer look at them. The most frequent species, Tillandsia punctulata, is the "fairy queen" of this mountain domain. She is surrounded by dozens of "court servants", the abundantly produced offshoots; her royal gown consists of soft and narrow, bright emerald green leaves which hold a dark, chocolate-brown base. The erect, 1-12 inch flower spike is set with shining scarlet bracts and is topped by a cone-shaped yellow "crown". 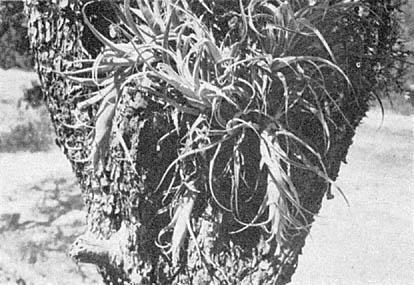 The root system of this exceptionally graceful and fine Tillandsia is well developed; however, the plants are only loosely attached to the moist bark of their trees. Here, they preferably grow in the shadier portions where the sun does not reach them during the hot hours of noon. Tillandsia punctulata is a very free-flowering, moisture-loving species of indeed, particular qualities. Although native to a rather cool, windy and wet region, it is most adaptable to warm conditions. Since it flowers nearly all the year round and its vegetative multiplication of stolons is a decorative thing, it is a worthwhile subject. Less frequently seen than the "queen" is the very showy Tillandsia lampropoda which bears some resemblance to the fabulous Ecuadorean T. Cyanea. Its broad, flat inflorescence, as red as blood is, at times, framed by a touch of yellow. The flowers appear for the length of a few hours only, protruding from the edges of the 'blade'. Here they follow one another in rapid succession during which the spike prolongs itself to almost fifteen inches in length, six of which are taken up by the flat part. It is a strong plant with heavy, dark green foliage and is as much a water storer as is its more dainty relative, T. punctulata. On the other hand, it develops, although fewer, larger offsets which make a couple of specimens appear like a very big colony of plants. No doubt you will love this bromel as much as I do! Vegetatively similar to the foregoing species is Tillandsia fasciculata, the third of the really spectacular bromeliads which so heavily coat the trees of this mountain belt of El Monte Obscuro, represented here in the variety, rotundata. In fact, I found T. fasciculata hard to distinguish from T. lampropoda if not in flower, and, unless actually touched by the hand, one does not notice the firmer, harder structure of the fasciculata foliage. However, once it pushes its deep, bright red, many-headed inflorescences toward the sun, we know what we are dealing with. "Many-headed" means that the inflorescence is composed of a number of one to two inch flat, but heavily crowded spikes which terminate in one single pyramid-shaped cone or cluster. Out of this, long (1-5 inch) deep blue flowers emerge. The plant itself is large and produces relatively few off-shoots which soon rival the base specimen in size. T. fasciculata var. rotundata is fonder of the direct sun than either T. lampropoda or T. punctulata since it possess harder, tougher foliage and develops a heavier bulk of strong roots. Joining this trio of red Tillandsias in the Dept. of Francisco Morazan there are a few more bromels, such as T. Seleriana, and of course, T. usneoides as well as several orchids. I gathered a few specimens of each and I am certain you would do the same if you ever lose your step far enough from home to find yourself in this turbulent land, notwithstanding, friendly and hospitable little republic in Central America called Honduras. Billbergia pyramidalis hybrid (?) showing difference in growth habit influenced by environment. Among the plants brought back to Baltimore in October, 1954, from Julian Nally's entrancing garden in Gotha, Florida, was an unidentified one, the subject of this note. It was among the collection of plants left by Mead, and had grown on for years, propagating by offshoots, but had never flowered. In its Florida locale the leaves are wide and stubby, overlapping for most of their length to form a short cone; aside from a faint purplish blush deep in the cup, the plant is an unmarked green. 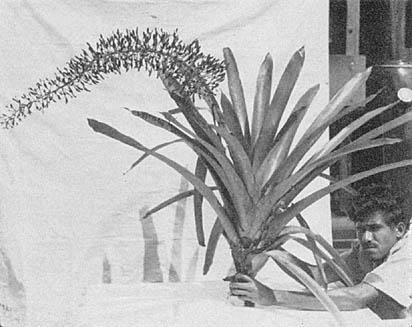 The plant was induced to bloom by treatment with calcium carbide, and appears to be a Billbergia – in all probability one of Mead's hybrids. The scape is slightly drooping; and though the plant is much smaller, the flush of color within the leaf bases suggests B. pyramidalis in its ancestry. 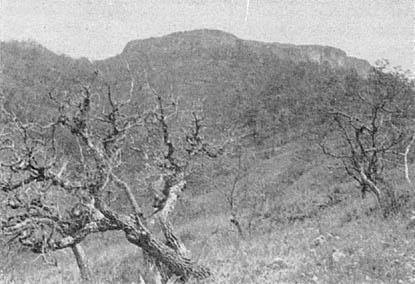 The accompanying photograph shows the remarkable extent to which the growth habit of this plant is influenced by environment. The 3-inch pot contains the original plant, nearly in its original shape, except for trimming back the leaf tips of the central growth as they turned yellow. The much larger plant in the 4-inch pot was grown from an offshoot and looks like an entirely different variety, the leaves being narrower and much longer, speckled and lightly banded, and forming a more open flaring plant. A Baltimore friend has another of these, and his experience parallels mine: new growths look quite unlike the original. What local factor or factors account for the variance is unknown. It is a commonplace observation that light, temperature, etc., modify growth characteristics; but this is the most striking difference yet seen among the bromeliads I have, and may be of some general interest. This has been the experience that most persons have had with bromeliads as well as many other plants that have strong light requirements for their natural size and color. The greater the light requirement in natural habitat, the greater the change will be when a plant is placed under less light and softer conditions. Light and air are two very important conditions for causing the finest form if the plants are not naturally shade-loving. Most Vriesias, Guzmanias and other thin leaf types are shade or semi-shade inhabitants. The stiffer the leaf the more light and air are necessary for the best shape and color. Just as great a difference in size as is described above may be seen under natural conditions in almost any species where one plant is in shade, another in brilliant light.